This salad is so yummy that it could easily be made into a dessert. 2 packages instant French vanilla pudding - 3.5 oz. pkgs. 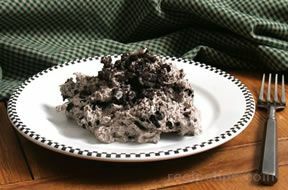 Crush the Oreo cookies into finely ground crumbs. If using a plastic bag when crushing the cookies, you may have to scrape out the inside of the bag to remove the crumbs that stick to the bag. Set crumbs aside. Have cream cheese softened to room temperature and then beat until smooth. Add in the whipped topping and beat until well blended. 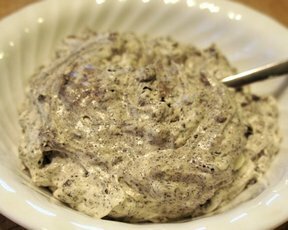 In a separate bowl, whisk together the pudding, milk and vanilla for 1 to 2 minutes, until smooth and thickened. 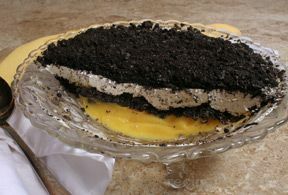 Begin layering the three separate mixtures in the following order: pudding, cookie crumbs, cream cheese, and ending with cookie crumbs on top. 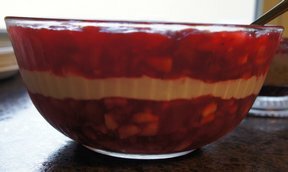 If you are using a trifle bowl, you should be able to repeat these layers. Be sure to end with the cookie crumbs on top.